Decorating Diva Tips: Need Some New and Creative Ideas for Your Wedding's Table Decor? Need Some New and Creative Ideas for Your Wedding's Table Decor? There are a number of elements you need to consider in the design of your wedding table decor, but none of them need to cost a great deal -- just a bit of coordination is required. 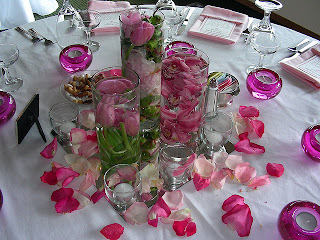 Submerged flowers - Use a range of different sized and shaped clear vases and glasses, and fill them with ice and water. Submerge the entire flower into each container, making sure the water is at (or very near) the top of the container, then arrange the containers in odd numbers in the center of the table. Scatter petals and leaves around to frame it. You can also use flower feeding gel, or glass pebbles in the containers instead of the ice. Floating candles - Guaranteed to add romance to any creative wedding table decor, a floating candle arrangement is about as low maintenance as you can get, for such big visual results. Continue the theme with candles arranged round the table, and use battery operated ones that just like the real thing for these ones to save any accidents - leave the real thing for the centerpiece. 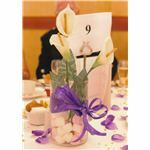 Edible decorations - Use candy such as gumballs, marshmallows, or different types of chocolates arranged in a glass vase. You can then use faux flowers inserted into these candies - the sweets will help the flowers stay up (until the guests decide to start eating your decorations). Or forego the flowers altogether, and opt for an entirely edible table decoration made of fruit. Flower pots - Nurture your own houseplants to save on costs, and add a sense of seasonality to the wedding table. Flowers that work well are lilies, orchids, daffodils, hyacinths and amaryllis. 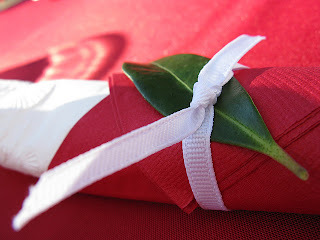 Tie a large wedding ribbon around the pot, cover it in fabric, or paint it to coordinate with your wedding theme. You could also paint an elaborate number or name of the table onto it too. Creative Place Settings for the Wedding TableWith ideas for creative table decor for weddings, it pays to think double duty. Not only is it less expensive, a decorated wedding table can get pretty crowded. 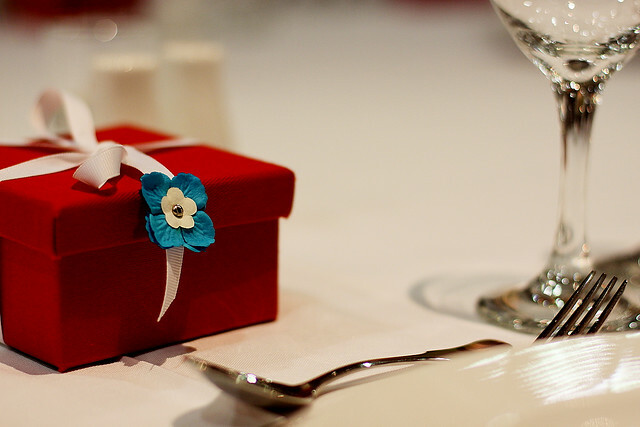 When it comes to the place settings, a wedding favor or gift for the guest is never far away. So combine these two elements into one, and make your wedding favors name card holders too. Mini flower pots with sugared almonds, or gold or silver dragees look great, are unique, and kids love them too. 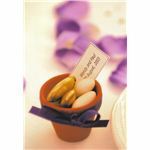 Insert a name card into the pot, then the guests can munch on the candy and take home the pot for their garden. Craft stores have plenty of options when it comes to pots, or try florists wholesalers. Mini photo frames aren't expensive (especially when bought in bulk), so utilize them to display the name of the guest at their place setting. They then have a wonderful photoframe to take home as a gift. A simple present, attractively wrapped and decorated could then feature a gift tag with the happy couple's names and date of the wedding on one side, and the name of the recipient on the other. With the centerpieces, place cards, and wedding favors taken care of, what about the rest of the table? 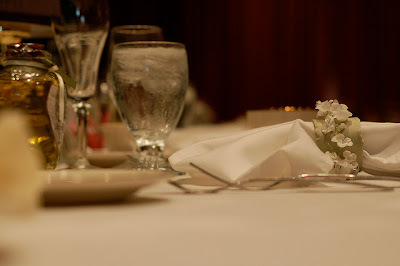 If the budget doesn't stretch to napkin rings then do not fear, a simple tied ribbon with a leaf or flower stem pushed underneath, is not only a cheaper option, it's also much more appealing to look at too. Don't forget the chairs. Making bows to decorate chair backs is inexpensive and easy to do yourself. 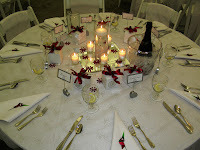 Evergreen foliage such as Ivy works great either down each side of a long table, or around the outside of a round table - you could also have it going around the table, behind the place settings, but in front of the centerpiece. You can use a length of marabou feathers from a craft shop in the same way, or even a feather boa or two. To complete your creative table decor for a wedding use rose petals, diamond glass filler, or battery powered fairy lights to fill in the gaps and glam up your wedding table. If you need more tips and ideas for your wedding decorations, please see our article on wedding hall decor ideas.